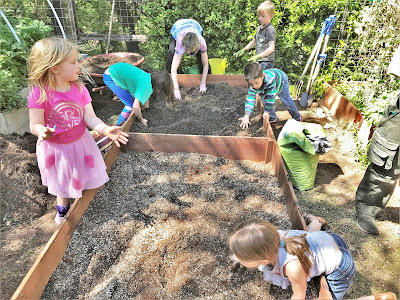 Garden helpers making super soil in the new garden bed make of cedar wood. A lot has been happening at RWCEG this Spring, 2019. We recently have had additional families join our garden community. To provide more growing capacity for our newest members, one of our deteriorated garden beds has recently been rebuilt. 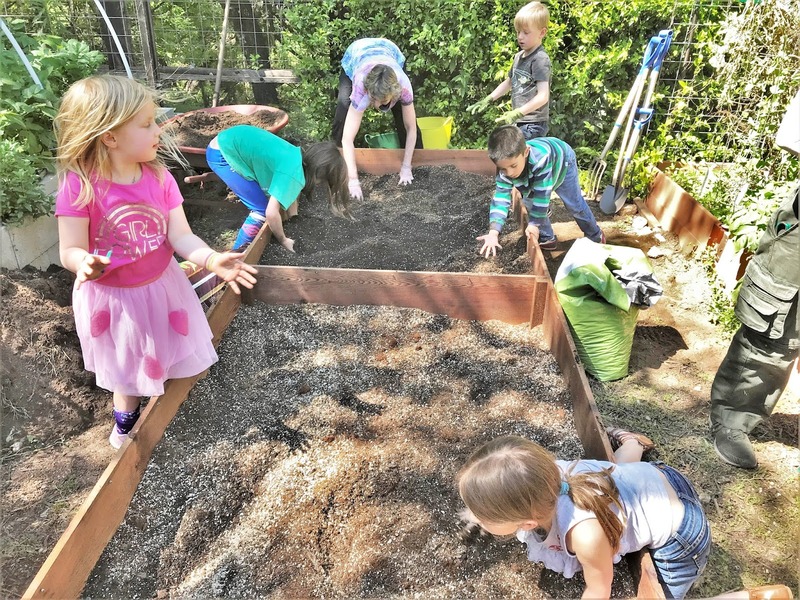 Special thanks to the Nyer family for obtaining building materials and constructing the new raised garden bed frame. The new bed is built of wood to complement the existing concrete-cinder-block and composite-plastic raised beds. Untreated Cedar wood was chosen since it will decay at a much slower rate than most other woods, and it will not leach harmful chemicals into the garden soil that could be absorbed by the plants. For additional protection against weathering, the wood bed has been completely varnished with two coats of raw linseed oil. Linseed oil is derived from pressed flax seeds (a super food! ), and it is considered a very safe, non-toxic wood preservative appropriate for organic gardening. 1. Multi-sourced Compost - This is the primary food for the plants. 2. Peat moss & coconut coir - Used for improved water retention. 3. Vermiculite - A heat expanded mineral full of air pockets. It is very light and used for water retention and aeration. It helps make the soil friable (loose) and reduces compaction for improved root growth. Glenn & Evan teaching gardeners about soil components. Garden helpers mixing soil ingredients. 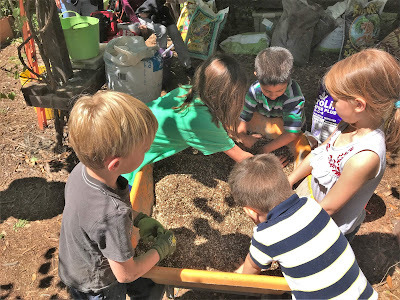 The RWCEG community would like to give a shout out to the primary supplier of our garden soil resources, Brite Ideas: Aquaponics, Hydroponics & Organics. Getting soil supplies at Brite Ideas with help from store owner, Troy (right). Seed packets bought at Brite Ideas.